The eights race was a tight race for the first half across across Victoria, WA, NSW and Queensland. However Victoria and WA broke away in the second half in fine style with Victoria leading narrowly. However in the last part of the race, the WA four man collapsed and was supported by the three man. This created the margin of 1 1/2 lengths at the finish. NSW was a further length behind. It was a great performance by the West Australians. 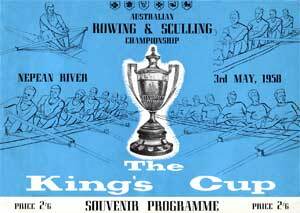 The NSW crew was depleted with it's strong representation in the 1958 Empire Games team which was selected in January 1958. The sculling race saw a fine win to Steve Roll of NSW from Squires of TAS. Roll took the lead half way through the race and led thereafter. Ken Goswell of Queensland dropped out with only a few hundred yards to go. Steve Roll recalls that he used a boat purchased by his father which was in turn financed mainly by his father's wholesalers of their corner store in Ashfield NSW. Gus Green who managed the Queensland team noticed that Steve was being cut to pieces by the seat in his boat. Gus arranged for a customised cedar seat to be made to suit Steve. Steve commented that it "was the most comfortable sculling seat I had ever sat on and I used it from that day onwards. I asked him how much it would cost. "Win the race and that will do." I obliged." 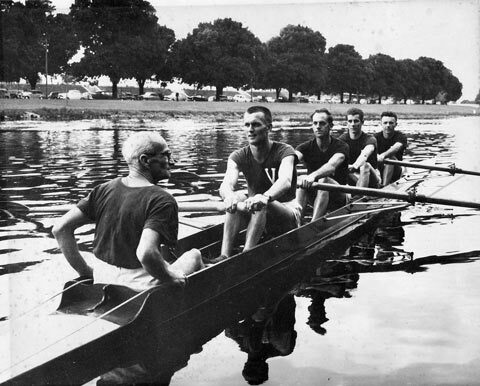 The inaugural lightweight fours Championship was raced over 2000 metres. Queensland led early but by the half way mark the race was between Victoria and NSW. These crews raced furiously over the second half of the race with Victoria winning by only 3 feet. 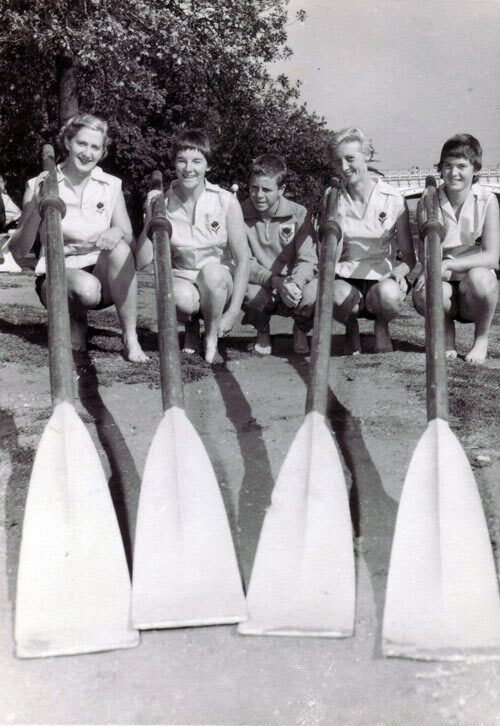 The following short history on lightweight rowing appeared in the program for this regatta. To Canadian Joseph Wright, champion sculler and former coach of the American University of Pennsylvania, must go the credit of the introduction of the Lightweight class of rowing. When Wright took up the position of crew coach at Pennsylvania in 1916 he discovered that he had a number of light but excellent oarsmen not big enough to make the varsity Eight. He evolved the idea of having a crew composed entirely of these lightweight men. The idea quickly spread to other institutions and in 1919 the American Rowing Association officially recognized the 150 lb. class. The Canadian Association followed the example of the Americans, and and introduced Lightweight rowing to their Canadian Henley Regatta. In 1924 at the U.S.A. Championship Regatta, the first Lightweight National Championships were held in Double Sculls and Fours with cox. The Lightweight Single Sculls Championship followed in 1925, and Eights the following year, 1926. Apart from the Americans and Canadians, a move was made in the N.S.W. Rowing Association to introduce Lightweight Championships soon after World War I finished. To this Association goes the credit of the first official Championship in this class of rowing. In the 1922-23 season two Championships were held: the Lightweight. Champion Eights of N.S.W., won by the Leichhardt Club, coached by the late Chris Kayser, and the Lightweight Champion Fours, won by Balmain. 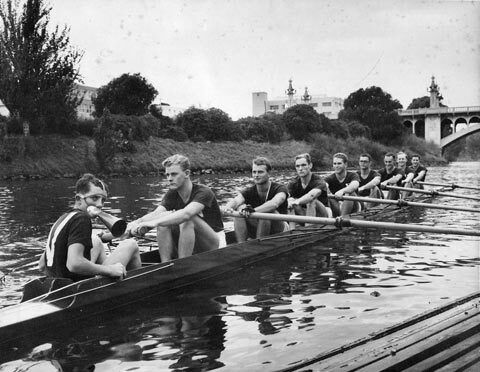 Other States followed, including Victoria, which first recognized Lightweight oarsmen with an Open Championship of Victoria held during the 1931-32 season, and won by the Richmond Rowing Club. From time to time in Australia various unofficial races have taken place in different States between Lightweight crews. Nearly twenty-five years ago a Lightweight Eight from the Bendigo Rowing Club came to Sydney on bikes to race at the Balmain Regatta. In more recent times Haberfield have won the Lightweight Challenge Eights at the Australian Henley Regatta in Melbourne, and Leichhardt Club in turn defeated the Queensland champions, Tweed Heads, in a special challenge race arranged at the Grafton "Head of the River" Regatta and went to Victoria to win that State's Lightweight Champion Eight. As a result of a letter written by the N.S.W.R.A. to the Victorian Association in 1947, a special challenge race was held between the two States at the Olympic Test Regatta on Lake Wendouree, Ballarat, on 3rd January, 1948. The N.S.W. crew, which was boated B. Harding (bow), D. McCray (2), P. McCray (3), K. Bond (stroke), W. Kerr (cox) and Mr. K. Manttan (coach) won a good race from Victoria. It is of interest to note that Bert Harding, bow in this winning crew, has since that date, as a coach, scored more wins with his crews in Lightweight.Championships than any other coach in the history of this class. The cox of this crew, Bill Kerr, had, ten years earlier, steered the Australian crew to victory over New Zealand and Canada at the 1938 Empire Games. European oarsmen first became aware of the Lightweight class when in the late 1920's several American University 150 lb. crews visited the English Henley Regatta to race in the Thames Cup for Eights. As a result of these visits, which have continued up to the present day, the Lightweight class spread all over Europe, and most of the European countries now have their own Championship in this class. million men, weighed on being drafted into the services, was 150 lbs. It was then moved and passed by F.I.S.A. that the Lightweight limit for all International races in this class would be 10 St. 10 lbs. ; that all such International races would be rowed over 2000 metres, and that oarsmen taking part in such races would have to make the weight on the day of the actual race. Thus, on the Nepean River at Penrith on Saturday, 3rd May, the first official Lightweight Championship of Australia will be held with crews from most of the Australian States taking part. There is a move from Europe to have this class of event included at future Olympic Games. This year Lightweights have been able to win State blazers. Who knows, but that in the years to come they may be able to represent Australia at the Olympic Games. The NSW crew led from start to finish. The Queenslander's race was described as "plucky" despite being outclassed by NSW and finishing 2 lengths in front of Victoria.